This year, we were thrilled to have engaged with members of our diverse and incredibly accomplished international UTS Alumni community in Hong Kong, London, Shanghai, Beijing, Vancouver, Ho Chi Minh City, Hanoi and Singapore. We learnt what you have been up to since graduating, reconnected with many long lost alumni, celebrated some outstanding individuals, and refocused our priorities for 2019. 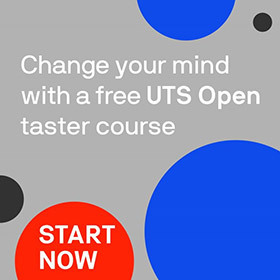 UTS hosted eight international alumni receptions in 2018, attended by over 500 graduates. We started the year by travelling to Hong Kong in April, where we hosted a panel discussion on ‘Building for Tomorrow’, addressing the challenges posed by technological disruption and how to prepare for the jobs of the future. Panellists included local Google Managing Director Leonie Valentine (MA Comm Mgt, 1999), Telstra Enterprise Head of International Marketing Melissa Brown (BBus, 1995; MBDA, 2006), and Dr Matthew Holt, a Transnational Academic Executive from UTS Insearch. In May, we visited London, where we had the highest attendance levels in over four years. Hosted by Vice-Chancellor Professor Attila Brungs, the event featured a keynote from Andrew Grill (MBA, 2001), former Global Managing Partner at IBM. Andrew is a sought-after commentator on issues around digital disruption, workplace of the future and digital diversity, so it was a privilege to hear him speak. We are delighted to report that the London network is now meeting once a month for drinks, an incredible outcome that we hope other networks around the world will be inspired to follow. Then in June, we travelled to China for two receptions, also hosted by the Vice-Chancellor, featuring panel discussions between some of our most dynamic and accomplished alumni. In Shanghai, multi-award winning automotive designer Casey Hyun (BDesign – Industrial Design, 1997) and one of China’s top lawyers Chambers Yang (LLM, 2001) discussed how technological innovation is intervening, both positively and negatively, in their respective industries. In Beijing, app entrepreneur Garry Wang (BBus & BSc, 2013) and digital marketing expert Saxon Booth (BA Comm-Journalism LLB, 2007; MA Int. Studies, 2016) shared their experiences with working in China’s tech industry and adapting to a markedly different workplace culture. In July, Professor Brungs travelled to Vancouver for a dinner attended by 11 UTS alumni living locally. Canadian entrepreneur and renowned philanthropist John H. McCall MacBain’s generously hosted the dinner in his home, providing a spectacular setting for our first foray into this style of intimate event. In September, we visited both Vietnam and Singapore. In Hanoi, DTT Managing Director Trung Nguyen (BSc - Comp. Science, 2002) along with WeLand Deputy CEO Viet Hung Nguyen (BBus, 2006) and Head of Large Corporate at ANZ Ha Bach (MBA, 1999), discussed the booming global development of Information & Communications Technology and Internet of Things, international exposure in business, and the importance of having a global outlook. Two days later in Ho Chi Minh City, XuanTrang Nguyen (BBus, 2006), Managing Director of a leading Vietnamese professional securities brokerage and equity firm, and Bruce Newton (BBus, 1982), Vice-President of Global HR at eSilicon, discussed emerging trends in their respective fields. In Singapore, we hosted an informal networking event to provide alumni with a social platform to connect with fellow graduates based in the city, and explore mutually beneficial opportunities. At our annual UTS Alumni Awards in September, Vietnamese tech entrepreneur Hoang Dao (BEng, 2006), Founder/CEO of app development company Early Start, received the UTS International Alumni Award sponsored by Insearch. Hoang created the internationally successful learn-to-read app Monkey Junior, and has dedicated his career to helping parents around the world give their children a head start on their education. Last month, at the 2018 Australia China Alumni Association Awards, we were proud to have five finalists across three categories. Chambers Yang (LLM, 2001) and Michael Ling (MBA, 2003) were nominated for Alumni of the Year Award; Cecily Huang (MA Journalism, 2016) for the Young Alumni Award; and Adjunct Professor Laurens Tan (DCA, 2006) and Dr Yi Ji (MIM, 2007; PhD, 2015) for the Arts and Creative Award. Meanwhile, at the 2018 Malaysian Australian Alumni Council Awards taking place this month, we have two alumni shortlisted in the Young Entrepreneur Award category: Shanker Joyrama (BBus, 2006) and Maresa Ng (BBus, 2003). Congratulations to this group of talented and ambitious alumni on your well-deserved recognition! In 2019, we want to focus on building our networks around the globe. We have established alumni networks in the UK, China, Malaysia, Singapore and Hong Kong, as well as newly formed networks in Canada and Europe. We are now looking to expand our networks in specific regions including Japan, India, Vietnam and the USA. We have also evaluated the format of our international receptions – based on both informal and formal feedback received throughout the year – and decided to make changes to offer the most value to our alumni. Instead of panel discussions and keynotes, we will focus on hosting social networking events as they facilitate opportunities to network and engage. We will also be looking at providing masterclasses on relevant topics of interest. These will be real-world, personalised learning experiences shaped by the passion and expertise of our staff and alumni. Become a mentor, now easier than ever through our Professional Mentoring Program. We encourage you to contact Angela Abbott, our International Alumni Relations Manager, if any of the above interest you or you would simply like to reach out for a chat.